Our ART LOVERS’ tours are organized and sponsored by the Gallery Council to benefit MAG and open to all interested travelers. Join the Art Tours Committee for an enjoyable day trip. Where we will visit is a surprise, but as those who have been on previous Mystery Tours know, it’s always a fascinating day. The day includes transportation, a lunch that you won’t soon forget and admission to our venues that will leave in you awe. We can’t tell you more about where we will travel or we might inadvertently drop a clue which would spoil the surprise of the secret itinerary and of this ever popular fun day. Download a flyer and registration form. For questions, please contact a tour leader: Jean Ligozio (585) 442-2479, jligozio@rochester.rr.com or Linda Cassata. 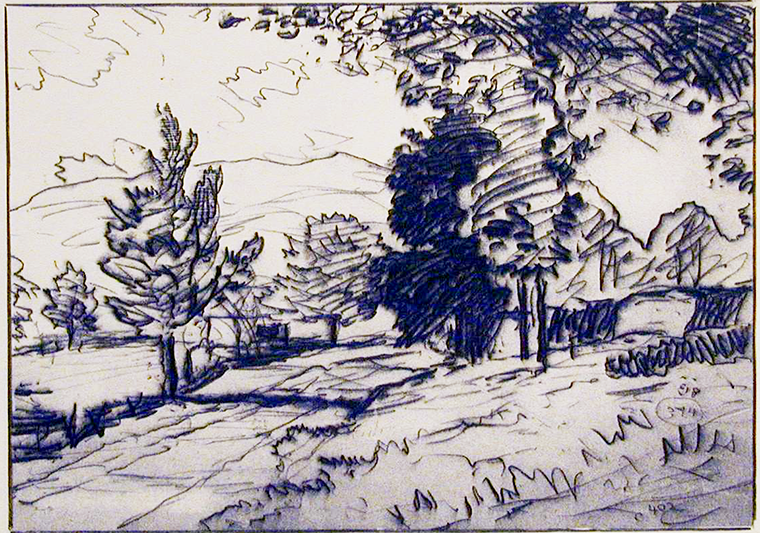 shown: Bolton Coit Brown, Country Road, 1921. Download a flyer and registration form. For questions, please contact a tour leader: Connie Schultz, 585.787.0701 or Nicki Millor, 585.381.0572. Yes, we’re going to the Shakespeare Festival again! Many of our repeat travelers are planning to go yet again! They have enjoyed the ambiance of the lovely town, the exquisite farm to table dining, and, of course, the wonderful theatre performances. This year we will see three productions: Shakespeare’s The Merry Wives of Windsor, Billy Elliott the Musical, and a new play, Mother’s Daughter. We would love to have you join us, so please make your reservation early as this trip sold out quickly last year! Download a flyer and registration form. The Memorial Art Gallery and University of Rochester Travel Club are pleased to invite alumni, friends, and family to join us on an exclusive art, architecture and Spanish cuisine adventure to Madrid and Barcelona. Our program blends contemporary Spain with historical, as in most countries the old and new are inextricably linked but perhaps more so in Spain where regional differences run deep and have created something truly unusual. We begin in the capital of Madrid, discovering the Art Walk with its master-packed museums. Explore Old Madrid’s historical alleys and wander through its imperial palace. Hop on a high-speed train and discover the miraculously wonderful Barcelona, where our adventures will take us to Richard Meier’s Museu d’Art Contemporani, Fundació Joan Miro, and the breathtaking 1929 Mies van der Rohe Pavilion for the World’s Fair. We will also get up close to and inside some of the masterworks of Modernist genius Antoni Gaudi. Take a scenic drive along the coast to Figures and the beautiful coastal villages of Cadaques to visit the museum and home of Salvador Dali. Throughout the program, we will enjoy wonderful Spanish and Catalan cuisine. Michelle Turner at (585) 747-1547 or email or Corinne Dagen (585) 273-2680 or email. Anyone unable to attend a Gallery Council event/activity offering a refund must make his/her request for a refund by contacting the Gallery Council Office in writing prior to the event. Requests for full refunds past the cancellation deadline will be granted if a vacancy is filled. Partial refunds may be considered upon receipt of the written request. All refunds will be less any non-recoverable costs and a processing fee of $25. If it is necessary for the Gallery Council to cancel an event or Art Tour, all payments made will be refunded in full. To expedite processing of your refund request, please print and use the Gallery Council Refund Request Form. The Memorial Art Gallery’s tour operator, Distant Horizons, is a California Seller of Travel (CST #2046776-40) and a participant in the California Travel Restitution Fund. Information regarding the rights of California residents to make a claim may be found at tcrcinfo.org. California law requires certain sellers of travel to have a trust account or bond. Distant Horizons has a trust account. For more information on this and other upcoming trips, or to be added to our priority email list, email the Gallery Council Office or call 585.276.8910. Join the Memorial Art Gallery Council on a program celebrating American art, architecture, and landscapes as we visit Kansas City, Missouri, and Bentonville, Arkansas. Visiting these two remarkable cities you will enjoy special gallery visits and private curatorial tours showcasing the influence art has had on this region. We begin our program in Kansas City, where this urban Midwestern city has made a big impact on the art scene. Here we will take in state-of-the-art museums, such as the Kemper Museum of Contemporary Art and the Nelson-Atkins Museum, while also discovering the emerging galleries at the Crossroads Arts District. We will then make our way to Bentonville where the Moshe Safdie designed, Crystal Bridges Museum stunned the art world when it opened in 2011. Together with Alice Walton, daughter of Walmart’s founder, Safdie, and Walton have excelled in recreating the idea of a museum. Along the way, we will be enjoying wonderful meals, including a stop at Arthur’s BBQ, named one of the best BBQ restaurants in the US. We welcome you to join us on what promises to be an exceptional trip.